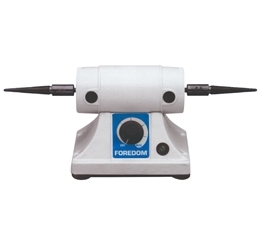 Powerful variable speed bench lathe in a compact size suitable for use at the workbench. Its permanent magnet motor is extremely quiet and smooth running with all the power and speed required for a variety of polishing and buffing jobs. Cast iron base has suction cup feet for a secure hold on the work surface. Lathe comes with tapered spindles for holding buffs and brushes up to 4 inches in diameter.